Alopecia Areata ( AA ) – A highly unpredictable autoimmune skin disease that results in hair loss with bald spots or bald patches. This can lead to Alopecia Totalis (total scalp loss) and Alopecia Universalis (total body loss) A conditions that affects around 2% of the worlds population yet there is no absolute cure. In its definition its unpredictability causes all manner of difficulty when treating. Understanding the fundamental aspects of its actions and how it manifests itself in the human form is key to offering the best advice and treatment which I might add is possible. We have treated 1000s of patients over the years (since 1964) with Alopecia Areata with a high level of success. If you are suffering from Alopecia Areata and want to know more why not give us a ring and have a chat with a TTS Reg. Trichologist. Or you can fill in the contact form to the right and a trichologist will email or ring you back on your request. Fill in the form above and a Trichologist will call you back. Call for a Free Telephone Consultation. Or email us your question. Many thanks. We offer a free telephone consultation with a Qualified TTS Trichologist. The number is located at the top of this page. These normally taken around 15 minutes. If you have any blood test results if you can have those to hand that would be great. It would be very useful if you have any pictures of the hair loss as well. We will give you a number to send them. This will often assist us in offering advice. 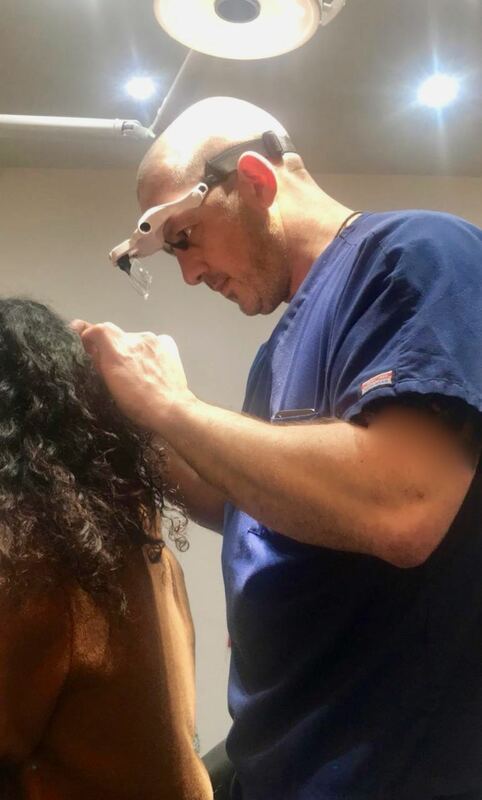 Please note that treating Alopecia Areata in most cases can only be effective using professional equipment at the Holborn Clinic. Why not give us a call and let see if we can assist you. Thank you and hope to speak to you soon. At consultation we will give a full scalp examination using the latest technology. Microscopic examination is also used in some cases. We would ask that you refrain from washing your hair for 48 hours prior to consultation. We would rather see the scalp in its worst state than that of a freshly cleaned. Your medical history is of paramount importance hence if you have any haematology please arrange to bring the results with you. Please be prepared to discuss your medical history in full as this often give us the key in offering the best course of treatment. Consultations at the Holborn Clinic take around an hour. If we are treating you then prepare to be with us for a couple of hours. 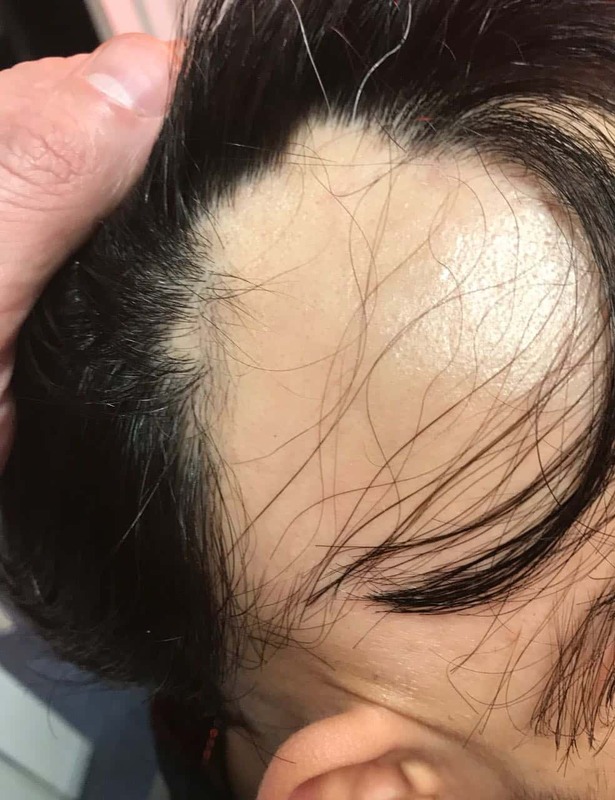 Typical cases of Alopecia Areata? Alopecia Areata tends to start with one circular bald spot about the size of a 50p. This can literally appear over night. Hair styles will often mask these spots and your hairdresser may well be the first to notice the hair loss. The single bald spot may grow back without treatment. However, due to its unpredictability, further patches may appear. It may also be the case that a single spot can spread considerably. The closer the spots the more likely they will join to create larger patches. Two or more bald spots may regrow without treatment. Sadly though, in many cases these patches will join hence the potential for further loss. Increased numbers of patches shows an increase inn severity. This is more likely to result in greater loss. Alopecia Areata can lead to total scalp hair loss (Alopecia Totalis) or total scalp hair and body loss ( Alopecia Universalis ). If it gets to either totalis or universalis it is highly unlikely to grow back. This is the million dollar question. Alopecia Areata can grow back without treatment. The difficulty with dealing with AA is that it doesn’t follow a normal trend. Every patient is different. Severity varies greatly. Time is of the essence. How do I know its getting worse? This is where we come in. A Trichologist who is a hair loss specialist will be able to advise on a probable prognosis upon examination. Remember this could lead to Alopecia Universalis. We have treated thousands of patients over the years very successfully for Alopecia Areata and other hair loss and scalp diseases. Contrary to belief there is treatment that can help Alopecia Areata grow back. Understanding the fundamental actions of Alopecia Areata against the skin is essential in seeing how the treatment actually works. effectively starts to attack the hair follicles recognising them as a threat. The treatment involves taking the body’s immune system off attacking the hair follicles and start to deal with what we are doing. These are tried and tested method that has been used throughout 50 years of practice. We are highly trained professional Trichologists registered with the Trichological Society. We know how to deal with such ailments. Why not give us a call and have a chat with a trichologist. We can explain this process to you in greater detail. The question I would ask yourself is are you a gambler? I ask this because each and everyone one of us has approx. 2-3 months of hair waiting to fall. This is quite normal. 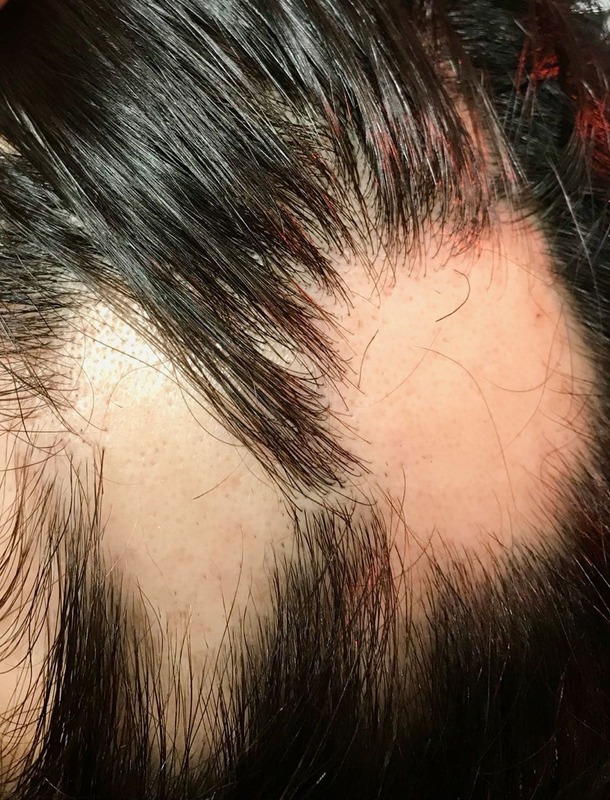 In cases of Alopecia Areata this time scale is the same however, you can never be sure how badly alopecia areata will affect you and for how long. Every day it affects you will result in hair loss 2-3 months later. The gamble is whether you wait and see if the hair regrows or do you treat it and potentially stop it getting worse? Its Definition A highly unpredictable autoimmune skin disease. which causes hair loss with bald patches. Alopecia Areata presents as small circumscribed bald patches which may multiply, expand or coalesce. Lesions may exhibit a characteristic stubble and pink or spongy skin. In severe cases this can result in total scalp hair loss (Alopecia Totalis) or total body hair loss (Alopecia Universalis). It shows no affiliation to gender. Research suggests the disease may affect up to 2% of the population. Although Alopecia Areata is a common hair loss disease, there are similar conditions that present similar symptoms some of which lead to Scarring or Permanent hair Loss. Do you know which one of the above images is Alopecia Areata? If you are suffering from hair loss with bald patches on the scalp or body you should seek professional advice at the earliest opportunity. Self diagnosis should not be attempted. I often get told from patients that they have been advised by their GP’s that there is nothing that can be done about Alopecia Areata. Some have been given steroids and bottles of shampoo. Steroid injections is another potential treatment via the NHS. 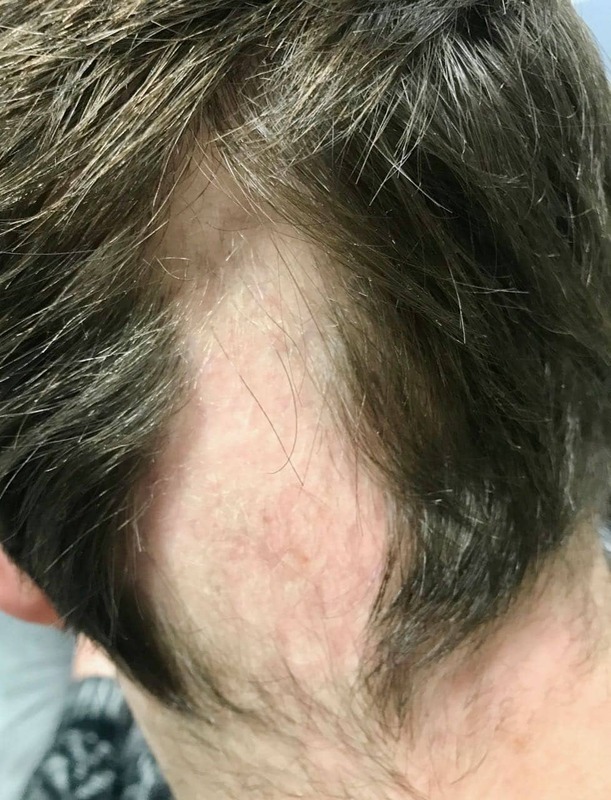 Unfortunately, waiting to see a dermatologist and then going through the ordeal of injections directly into the scalp with potential side effects and limited success in my view is not the way to deal with this condition. Steroid lotions and shampoos tend not to work. Some treatment from GP’s is extremely useful especially when dealing with the actual cause which of course is the main investigative aim. Alopecia Totalis presents as total hair loss of the scalp region only. The scalp hair will shed over time starting with hair loss with bald spots. The bald spots grow and join resulting in Total loss of scalp hair. This is the most aggressive form of hair loss resulting in total body hair loss. This will start with bald spots. Alopecia Totalis will encompass Alopecia universals. It is suggested that you will have 1 in a million chances of regaining hair. There are some specialists who use steroids and immune suppressants to counteract Alopecia Universalis. This is not recommended.